Countries discuss rule that prohibits members from negotiating free trade agreements individually during Macri's visit to Brazil. RIO DE JANEIRO, BRAZIL – Brazil and Argentina are discussing the possibility of easing Mercosur’s trade rules and allowing members of the bloc to negotiate individual agreements with other countries. The issue was examined during the first official visit of Argentine President, Mauricio Macri, to Brasilia on Wednesday. 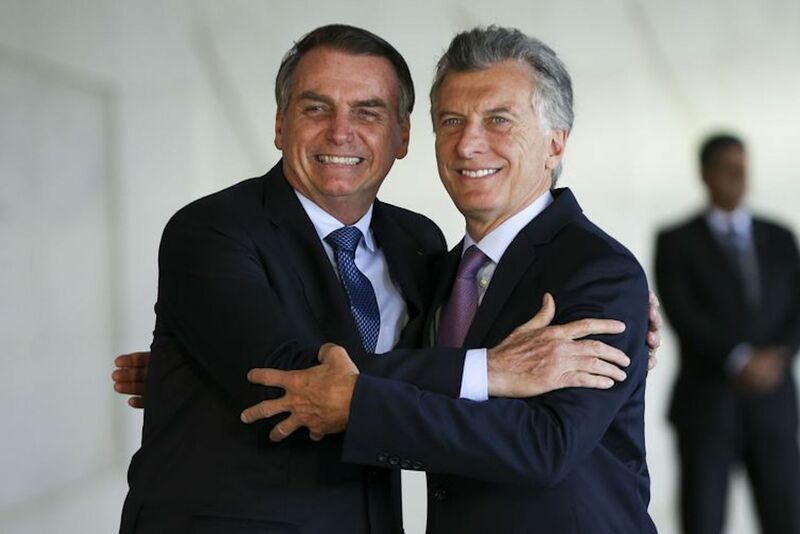 Presidents Jair Bolsonaro and Mauricio Macri after first official meeting between the two leaders in Brasilia, photo by Marcelo Camargo/AGencia Brasil. “The presidents decided to work during their consecutive pro-tempore presidencies in 2019 to review the common external tariff, improve access to markets, and advance in trade facilitation and regulatory convergence,” said a statement released by Brazil’s Foreign Affairs Office after the meeting between Macri and Brazil’s President, Jair Bolsonaro. “At the external level, they agreed to push forward the most promising negotiations already under way and to assess the start of further negotiations with other partners,” concluded the statement. According to Mercosur’s rules, members, which include Argentina, Brazil, Uruguay and Paraguay, are prohibited members from negotiating free trade agreements individually. Venezuela was suspended from the bloc in August of 2017. In November, after Bolsonaro won the presidency, his Economist Minister, Paulo Guedes, caused tension between the two countries by stating that Mercosur would not be a priority for Brazil. After the meeting with Macri, Bolsonaro stressed that the Brazilian government is determined to carry out ‘far-reaching’ economic reforms that will unleash the bonds of growth and generate employment and income. “We are looking for an efficient State and a thriving private sector. We seek environment that favors the entrepreneur and increasing openness,” said Bolsonaro. Hi-level officials from both countries also took the day to discuss joint actions in the fight against organized crime, drug trafficking, corruption and border security. “We are confident in the modernization of Mercosur, both in its internal improvement and in the expansion of its relations with the world,” concluded Bolsonaro.